Exploring the old town of Aviles really is a pleasure and with most of the tourist sights triangulated between the three parks of las Meanas, Muelle and Ferreria, finding one's way around is relatively easy. It does however pay to branch out a little bit beyond this central old district "hub” if you are to see everything that the town has to offer, and one such building is the Teatro Palacio Valdes (theatre). Although only just outside the main area frequented by tourists, many miss this building because of its location. It is set on a fairly narrow road close to the port area and is not easily spotted or indeed photographed. It is though worth seeing for its rich and highly detailed stonework and it is definitely different to the typical architecture of the city. The theatre was built in the 1920's and was designed by architect Manuel del Busto. The Teatro Palacio Valdes holds around seven hundred and fifty people. One of the main roads leading to the old district and ultimately running from the Espana plaza is la Camara Street. Taking this route out of the old district (and heading to the "maritime” district) leads you past two interesting buildings in the form of the church of Tomas de Cantorbery and the unusual casa de Eladio Muniz. The casa de Eladio Muniz was originally a mansion house and although only constructed just over one hundred years ago has some fine and detailed stonework. Today, with the demolition and replacement of many of its surrounding structures, this building looks strangely out of place, but sill occupies a busy spot in the newer stretches of Aviles. 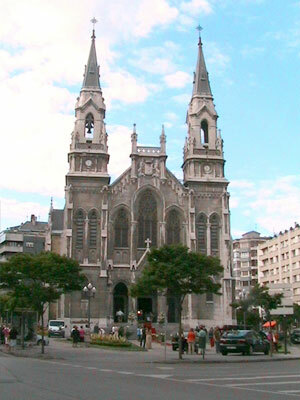 Only a short distance from the building mentioned above is the Iglesia de Santo Tomas de Cantorbery Aviles. This church started life some eight hundred years ago, although it is unlikely that any of the original building remains today. This church should appear tall, slender and white with two graceful spires and a number of arches incorporated into its delicate design. Unfortunately, because of its city location (outside the main pedestrianized zone) its white masonry has become discoloured from smoke and fumes and the building has lost a little of its visual impact. After passing the Cantorbery church (mentioned above), only a short distance away is yet another of Aviles many squares and this one is called the plaza de Carbayo. This square, although small, is particularly attractive and, in addition to being overlooked by the Iglesia Vieja de Sabugo, is faced by the attractive Calle Bances Candamo (street). This results in this little area being highly colourful with most of its buildings washed in yellows and ambers. 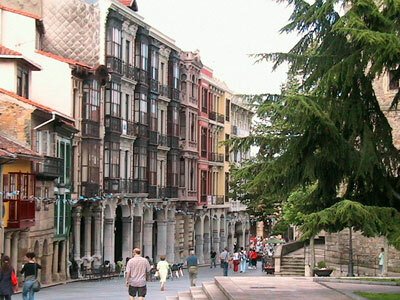 The mix and unorganized appearance of the plaza's buildings also adds to its aesthetic appeal, as does the narrow and slightly inclined route of the Calle Bances Candamo as it leads roughly in the direction of the Muelle park. 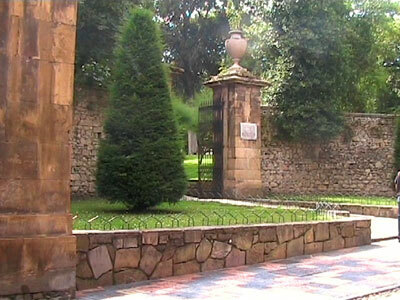 The Parque de Ferrera is the largest municipal area in the old district and has a small river running through it. Within this park there is a band stand, a water fountain and a number of ornamental features. Many parts of Aviles are illuminated at nighttimes and the Plaza de Espana in particular becomes very atmospheric once the natural light has faded into the evening's dusk. The whole of the old town takes on a different look once the evening has set in and this is enhanced by the many bars and cafes and the constant noise from those socialising within them. Aviles old town is definitely not one to be missed.